The stellar view from the International Space Station may be a little sharper for some astronauts now. When NASA's space shuttle Discovery arrived at the station Saturday (Feb. 26), it was carrying a handful of new Superfocus glasses, which are designed to let bespectacled astronauts focus on objects at various distances by moving a slider on the bridge. "I think this is going to be a significant improvement for some individuals," said C. Robert Gibson, a vision consultant to NASA Space Medicine. "Their day is spent looking at things within 4 to 5 feet." The average age of the spaceflyers in NASA's astronaut corps today is 48, Gibson said, and as a result many suffer from presbyopia. In this condition, the lenses of aging eyes become increasingly inflexible, making it tough to focus on things close up. Simple tasks like reading can become a challenge. The solution for many middle-age people is to get reading glasses, bifocals or progressive lenses to compensate. But these options have drawbacks, such as distortion, areas of blurriness or a limited field of view, Gibson said. Superfocus glasses take a different approach. They are built using a set of front lenses to hold the wearer's distance prescription, while inner lenses contain a clear fluid. Moving a slider on the glasses' bridge adjusts this fluid, allowing people to focus on objects that are nearby or in the middle distance, company officials said. "We mimic the natural action of the lens inside your eyeball," said Adrian Koppes, CEO of Superfocus, which marketed the glasses in 2009. The result, according to Gibson, is a sharp, distortion-free image at a variety of distances. Users can shift from reading a book, for example, to looking across a room just by sliding the bar. Astronauts on the space station may well appreciate the glasses' flexibility — especially since anecdotal evidence suggests that microgravity can affect vision, causing a farsighted shift in some people, Gibson said. NASA launched Discovery on Feb. 24 to deliver a storage room and a humanoid robot assistant, called Robonaut 2, to the International Space Station. The mission is the final flight of Discovery before NASA retires its space shuttle fleet later this year. But in addition to Discovey's big-ticket cargo items, two pairs of Superfocus glasses were packed for two shuttle astronauts. Discovery's crew will also leave four pairs of the glasses for astronauts on the space station, Gibson said. There are six crewmembers currently living aboard the orbiting lab. NASA has put the glasses through a flight certification program that included a comprehensive structural and material review, Gibson said. 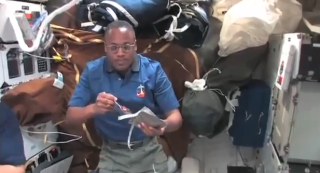 "Resupply is not that frequent on the station, so these glasses will have to survive the rigors of space," Koppes told SPACE.com. Superfocus glasses may indeed help middle-age astronauts read the station's many instrument panels without squinting too much, but the glasses do have their limits. They can't be worn on spacewalks, for example. "Astronauts can't adjust them in their spacesuits," Gibson told SPACE.com.